Fashion: a temporary expression of identity, time and culture. Style: a timeless appearance no matter the fashion. Classics: fashion that have become style codes. It's a bit confusing, but classics can only become timeless when they have overcome fashion. Take a check, the pattern that shaped all fashion thanks to the dress code of the legendary Kurt Cobain back in the 80's. A grunge phenomenon that has been re-invented season after season, whether leading or following the current trends - checks have always been around. It is called a classic now, thanks to its loyal presence over the years and certainly dominates the wardrobes of many style masters. This winter season checks have, yet again, taken over the trend forecasts and claims its position as timeless style and temporary fashion. In other words, you can never go wrong with checks. Checkmate. 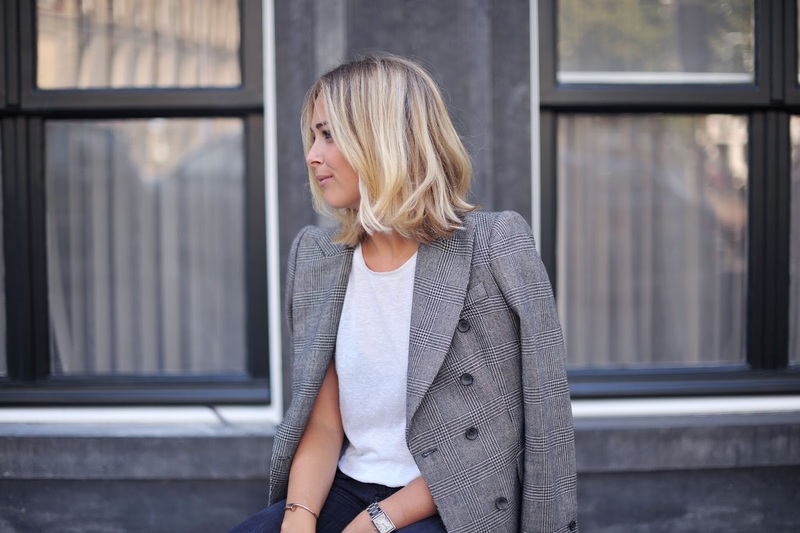 Nooit gedacht dat een geruite blazer zo cool kon staan met Dr. Martens! Love when things overcome fashion and become classics and also part of personal style. Wat een mooi jasje, zeker een klassieker! Perfect outfit, I love the jacket, this style is amazing! Leuke combi van net jasje en afgedragen broek. Enne, wat lijkt je haar weer kort! Leuk wel.